That's the GG's "Army" uniform, isn't it? I'm guessing it'd've had the crossed swords before. It's more that his uniform hasn't been updated. jrichardn2 wrote: That's the GG's "Army" uniform, isn't it? I'm guessing it'd've had the crossed swords before. It's more that his uniform hasn't been updated. on the image you clearly see their presence on Charles who wears a canadian pre-2014 lieutenant general uniform unlike her. The crossed swords on the GG in your first pic look like a late add-on; talk about random placement...! The ones on Charles' uniform look better positioned. I'm surprised no-one thought to upgrade the GG army uniform to include the general officer gorgets -- or maybe ones with bullion maple leaves, just to make them a little bit different to the oak leaves on the standard army gorgets. Examples of something like that appeared on here when the change of insignia was first discussed. Medic_in_Uniform wrote: The crossed swords on the GG in your first pic look like a late add-on; talk about random placement...! The ones on Charles' uniform look better positioned. While I assume that when they get around to it they will simply give the GG general gorget, I think that WW1 maple leaf gorget I linked to in another thread would not only look great but make sense symbolically. Baring that, maybe they can come up with a new interesting design such as something like this that continues the green field bordered yellow on his shoulder straps and sleeves with some maple leaves added in. Marc, I've seen a JPEG of gorget that uses maple rather than oak leaves, but your reference to WWI had me look up an image of Canada's first general, Arthur Currie. Are the dots on his gorgets the maple leaves of which others speak? It pops up in another pic, clearly of the same era, maybe the same day, as this one. Otherwise, I couldn't find an image of a Canadian general in either world war, wearing gorgets with these "dots". 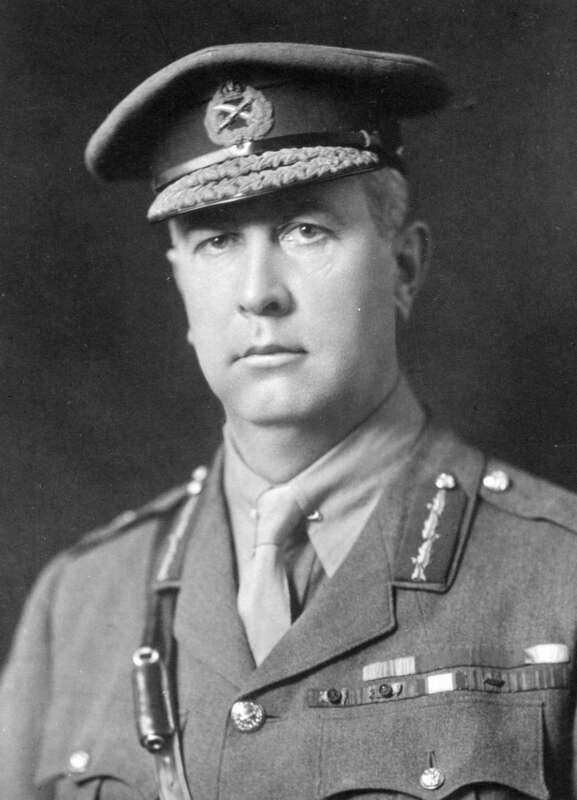 jrichardn2 wrote: Marc, I've seen a JPEG of gorget that uses maple rather than oak leaves, but your reference to WWI had me look up an image of Canada's first general, Arthur Currie. Are the dots on his gorgets the maple leaves of which others speak? I'm 99% sure those are acorns. I've seen gorgets pictures with such acorns, and I believe the following offers a clearer image. Yep, the old monochrome pic of Gen. Currie does indeed show the standard pattern oak leaf gorgets with acorns. They're almost exactly the same as those worn by the Lt. General in the picture linked in the first post, and also a variant still seen in the UK. The maple-pattern gorgets I haven't seen anywhere else either; perhaps they were a prototype...? Whatever the origin of the originals though, that's definitely the pattern I had in mind for updating the GG uniform: it would visually bring it into line with the other general officer uniforms but the maple leaves are a nice differentiating detail from the career military officers. They should definitely do that. The standard generals' gorgets would be better than nothing but the maple pattern would be perfect. This picture, from the May 29, 2016 Kindle version of the Denver Post seams to show the Governor General in a very different uniform. The picture is no longer attached to the online version of the story. gghbisa wrote: This picture, from the May 29, 2016 Kindle version of the Denver Post seams to show the Governor General in a very different uniform. The picture is no longer attached to the online version of the story. yes, normally you would expect a lion on his shoulder pad, not a canadian flag. must have something to do with stormtrooper traditions.